The deformation monitoring of a land or construction represents a systematic action of observation, measurement and analysis of the way they respond to influence of surrounding agents, taking permanently in consideration the projection parameters of functionality, stability and safety. For a proper monitoring of construction behavior in time constructions that are subjects to experimental solicitation obtaining observations in a relative short time in highly required. 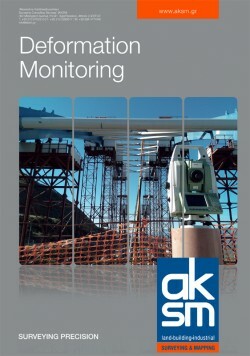 By using high precision equipment, software and methodologies and especially with many years of experience in the field of deformation monitoring, AKSM can provide results, to meet the requirements of delicate projects. Leveling measurements are taken on leveling pins installed at the ground surface or on buildings and/or on deeply embedded rods. The leveling pins on a surface or on buildings (e.g. vertical features, columns and walls) are of the embedment screw type of galvanized steel. Alternatively, where drilling and embedment is impossible, leveling contact pins are used with an aluminium plate or corner and a steel ball suitably adhered to a hemispherical hole of same diameter. The measurements of the leveling points are carried out with a precision of at least ± 1mm per kilometer and always with open leveling routings, completely dependent from their two ends on the leveling starting points (benchmarks) with known elevation. The instruments and their accessories (remote distance devices, tripods, etc.) are serviced, checked according to the instructions of the manufacturer and will be replaced when it is necessary. In case of ground surface above tunnels, sections and grid of pins according to the monitoring design plan are installed. The distance between the pins of each section is subject to the design study. On the road pavements, the layout varies depending on the actual conditions. In all other cases except the above, pins are developed on a grid covering the entire influence zone. Pins that cannot be installed (e.g. in streets with heavy traffic) can be placed and measured at any other location further to pertinent communication with client.